USHUAIA, TIERRA DEL FUEGO, ARGENTINA: Look at any map, and you’ll see that this small city (population: about 58,000) is indeed the southernmost on the planet. Situated on the historic Beagle channel, a picturesque waterway once traversed by Charles Darwin on the HMS Beagle, Ushuaia (“bay looking to the west” in the indigenous Yamana language) has become, over the last few years, a virtual magnet for travelers in search of a destination truly off the beaten path. In some ways, this remote and sparsely populated region at the bottom of the South American continent is not unlike some areas found in certain fringes of Alaska, Greenland, or Arctic Russia. Apart from the original Ona and Yamana tribes, many of the original colonists were English and Spanish, followed by Lithuanians, Croats, and Lebanese. Tierra del Fuego’s first permanent settlement, Estancia Harberton, was built by an Anglican minister from Devon. These early pioneers had to endure almost insurmountable hardships which would be difficult to imagine today. Not the least of these challenges was the weather, which could be savage beyond belief. 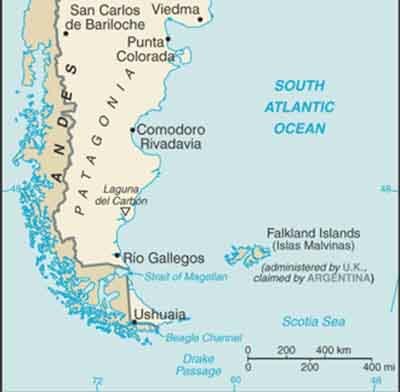 So strong are the winds, in fact, that many trees survive by growing not upward, but actually sideways-not surprising when you realize that the infamous Cape Horn is only about about a hundred miles from Ushuaia, with the Antarctic peninsula seven hundred miles beyond that. But sometimes-especially during the austral summer, when the sun shines for almost eighteen hours-you wouldn’t be blamed for thinking that Ushuaia was one of the busiest and most cosmopolitan small cities on the planet. In fact, sidewalks can be so crowded-with tourists and locals alike-that one often has to step onto the roadway to avoid the congestion. Almost everywhere you go, the streets are lined by hotels, guest houses, restaurants, clothing outfitters, electronics and camera stores, tour operators, banks, jewelry shops, museums, and souvenir outlets. A few miles away, there are other attractions as well: a former prison (now a museum), a steam railway, a national park, and breathtaking treks to the surrounding glaciers. And-unusual for similar isolated communities, and much to its credit-Ushuaia’s local government expends considerable money and effort each spring to plant flowers virtually everywhere. Visitors here are from just about anywhere you can think of: Japan, China, Turkey, Europe, the United States, Australia, or neighboring Latin American countries. Among them, motorcyclists on their once-in-a-lifetime trip; bicycle riders making the ultimate journey; trekkers, sailors, and mountain climbers. The list goes on and on. But all have one thing in common: you probably wouldn’t find them on a Carnival cruise. A good example is Pierre Paul, a 67 year-old bearded adventurer who had walked (yes, walked) all the way from Quebec, Canada, transporting his tent, sleeping bag, clothing, and food using a three-wheeled cart. His 20,000+ mile odyssey had taken him two years, three months, and twenty-two days. I asked him what had motivated him. He shrugged. “Just wanted to be able to say that I did it”. Which-in my own mind, at least-pretty well summed up why most visitors come to Ushuaia in the first place. But, then again, their adventures don’t necessarily end here. For Ushuaia also happens to be the world’s busiest port when it comes to the ultimate cruising experience: Antarctica. There are now more than a dozen major operators, including the National Geographic Society, which cater to high-end travelers from practically every corner of the globe. For those who can afford it, these highly-specialized cruises (complete with on-board lectures by renowned polar experts, along with visits by rubber zodiacs to multiple scientific bases) represent, for many, the adventure of a lifetime. Later, back on terra firma, many of these same passengers can be found sharing their polar experiences with each other by candlelight at Chez Manou, undisputedly the world’s southernmost gourmet restaurant. Its owner and chef, Emmanuel Harbin, is an expatriate French culinary people rfectionist whose previous tenures include the Tour d’Argent and the famed Hotel de Paris in Monte Carlo. With picture windows on three sides, and at an altitude of almost 1500 feet above the Beagle channel, its stunning views almost make you believe that you’re dining aboard the International Space Station. Surely, A great way to remember the end of the world.